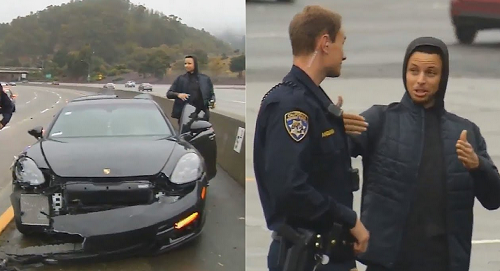 Golden State Warriors star Stephen Curry was involved in a three-car crash on a California highway on Friday, but he did not suffer any injuries. Authorities say Curry was driving a black Porsche when the driver of a Lexus lost control and struck his car. 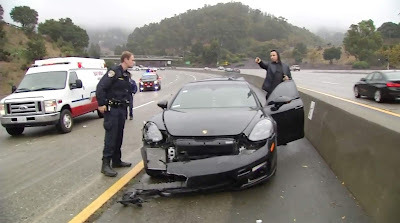 Curry stopped in the center median, and as he waited for officers to arrive, another sedan lost control and rear-ended his Porsche about 10 minutes later, according to California Highway Patrol Officer Herman Baza. Curry, who made it to the team practice facility for shootaround after the crash, later tweeted his thanks. Golden State coach Steve Kerr, speaking before Friday night's 125-97 win against the Trail Blazers, said Curry is feeling fine. "He was a little shaken up like anybody would be getting into a car accident, but thankfully nobody was hurt and Steph's doing fine," said Kerr, who joked that Curry probably "has another car that he can drive." Curry has been out for the Warriors since Nov. 8 as he continues to recover from a strained left groin. He did not play Friday and also will miss Saturday's game against the Sacramento Kings.